Working in a sales team is kind of a fun job. Generally, all the sales people deal with customer interaction sessions and there will be some kind of field work for that too. Sales officers who work as product endorsers and product marketers have held the sole responsibility of selling the product on their own. Every sales officer does his / her job so promptly without any excuses. Sales officer are given such work on the basis of some target which is been fixed by the branch manager. 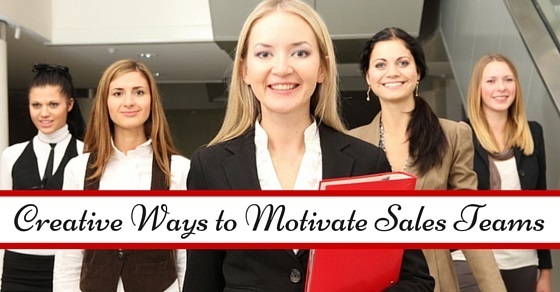 Following mentioned are few ways to motivate sales teams. A sales officer tries to reach his / her target with all the hard work and dedication. And to reward their hard work or dedication, a branch manager needs to appreciate and them with certain team motivation and such motivational methods are as follows. A sales manager does his/ her work with all the dedication and hard work. It’s their duty to render service to the customers so that they deserve what they need. It’s a main goal of any sales officers to provide their customers what they want to buy not that what a salesperson needs them to buy. A salesperson has to provide his / her target reached, so that at the end they will be rewarded or motivated with higher commission as appreciation. A sales team is created so that the work of the team should be seen as the work of a person. A team work always gets appreciated because of all member’s efforts. For motivating sales team, a branch head needs to take care of his / her sales staff. These members of a sales team need to be rewarded for their united work efforts. These work efforts are appreciated so that the end results of the company need to be hiked. To make a sales team compare their work effort with others, there should be a certain kind of gestures where they start comparing their own work. To appreciate such work efforts the branch manager needs to start announcing the employee of the month and worst performers of the month and much more. These kind of best and worst appreciation in a public manner will help them to grow in their own sales skills. Ultimately this will create a motivational feeling among themselves. A company working with sales endorsement products has their own targets to meet. These targets will be helping them to put their extra effort in their work. A sales indulged company will try everything to get that target to be reached. A whole company will start selling their own product, this will create such an environment in the company that all the employees will be encouraged to show their effort on this particular campaign. In a sales company, a manager needs to be clear with his / her ideas regarding the motivational efforts. He / she should be aware of those rewards after effects also. Sometime there will be some kind of difference in thinking regarding these rewards or appreciation. A manager needs to start some survey to know what kind of elements create some kind of motivational urge in oneself. By doing this a manager at the end will come to know that how to trigger his / her sales officers. To encourage one’s sales team a manager needs to conduct such meetings, which will analyze or follow up the sales team hard work every single or at the end of every month. By conducting such follow ups or meeting a manager will find out the actual targets or work completed in a span of time. In these meetings a manager needs to encourage his / her sales team work a little hard to increase sales, meet the targets at the end of the month with some reward for their work. When a company conducts such appreciation official ceremony, they invite their families or spouse to such ceremonies to make sure that the achievement they get will be considered as an excellent one without any doubts. To respect one’s family or spouse, the companies allows sales officers for inviting their family or spouse to such ceremonies. It will motivate him / her to work even better for the company who showed such respect regarding their work. Sometimes a salesperson gets oneself involved in his work in a way that they accomplish their desired targets within a time. That time they expect that the company they are working for needs to check their credibility of the work which they delivered without wasting much time. At that point of time, to encourage in their work the manager needs to give them the project they really work on to and the project they earned to work on. This will create a kind of motivational environment for such a sales person. By distributing complementary gifts for all the sales team as a token of their efforts on gross sales of the company. These complementary gifts are one of the ways to motivate employees to work even harder. These complementary gifts can be an expensive one. These expensive complementary gifts for all the sales team will create such a successful environment for their work that they start taking their work and their efforts even more seriously. Ultimately things will fall in places as expected by the company. For a sales team motivation, a manager or the company needs to check all the available possibilities which will suit their budget and the sales team efforts. By offering them an exclusive membership voucher in an exclusive club or restaurant will let them work in a better manner. By differentiating a high level performer from others and allotting an exclusive membership voucher to them will create an anger in the rest of the team members to work in a better manner to avail such benefits. A company also tries to motivate team members with a team lunch or dinner. These kind of team lunch or dinner can be initiated by the branch managers and these team lunches and dinners are conducted to appreciate the team efforts of the sales team which eventually outdone themselves with their excellent work and efforts. These kind of lunches or dinners will be given only in an exclusive restaurant which is not so regular for those sales teams. Some sales team members appreciate the gesture of certifying them to be good at their work which will create a superiority in themselves to work better. By offering them certificates for their excellent work can create an environment of being powerful among others. These kind of efforts to appreciate a sales team creates such a motivational zone for the rest of the sales team, which couldn’t get their chance to certify themselves. It is the manager who needs to take responsibility to motivate sales teams. These kind of motivational activities also can be delivered through some kind interesting games. These games should encourage all the sales team to achieve their targets by involving more efforts from their side. And at the end, the result of such motivational games will be shown in the end market results of a team combined efforts. And which ultimately satisfies a branch manager. A sales team needs to be motivated constantly so that there will be a remarkable effect on their end sales sheet. To make this happen a branch manager needs to give them a little break from their work so that they can work with a fresh page and with fresh thoughts. This can be made through some kind of entertainment program which are conducted for the sake of the sales team which will be less refreshing for them other than their usual; work and duties. A sales team works as a team and the team is a maintained by a manager. These managers need to pick those sales team members who had worked excellently in that particular month or year. A manager needs to recommend that sales team member to be sent to such exclusive advanced training session of the company so that can be turned as an asset for the company. By providing such advanced training as a motivational support creates a certain kind of responsibility amongst those sales team, which has been provided to them and this ultimately gives motivation to work hard to achieve company’s goal. This kind of reward will make them speechless. A feeling of meeting a CEO personally is a feeling like meeting a president of the country or one’s favorite actor or actress. These kind of gesture in the name of motivational efforts will definitely work on a managers side. And even this will work on those officers who couldn’t make that happen because of some reasons and they will keep trying hard to get that single opportunity. There is another way to motivate sales team and that can be by announcing complementary trips for all the sales team members. These trips are conducted to give a sales team fresh start for their sales target. These complementary trips for all the sales team motivates all of them to come up with an innovating and creative ideas to achieve their targets. This can be turned in as a very favorable situation for the company and the result of such trips are very positive and effective. By announcing an employer of the year at the annual company meeting will be considered as a prestigious thing for all the employees. Those who achieves such honors will be considered as the best among all. These kind feelings which state that the best employer of the year, gives other a start to achieve their goal in one’s life to gain an employer of the year title. This ultimately motivate sales teams to work hard and also to work effectively. To end this discussion we would suggest that a company needs to keep motivating their employees, which involves teams such as sales team, finance team and human resource team. To encourage these teams a company needs to start motivating by using several ideas. These ideas can be professional or personal, but at the end, it should show its effect on one’s company working teams. The rest of the team which works effectively in a company needs all the comforting elements of the company. But the sales team requires a certain kind of reward or appreciation for their excellent work. And here are some of the creative ways to motivate sales teams. Therefore, to consider such team motivation ideas, a company needs to start effective sessions of appreciations. By following such creative motivational ideas a manager can motivate sales teams to achieve their target. Next articleHow to Report Unethical Behavior at Work?